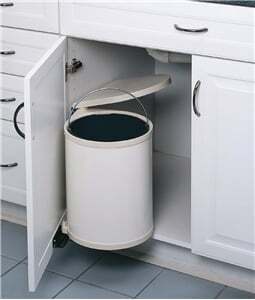 OVISonline.com offers Rev-A-Shelf white pull-out trash cans & waste containers in many styles. 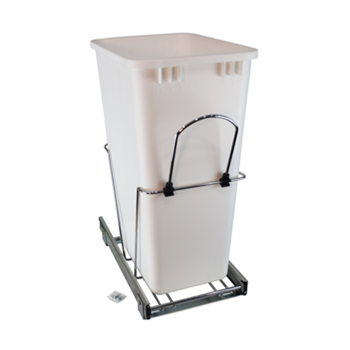 Single, Double, and Recycler units are available in white. 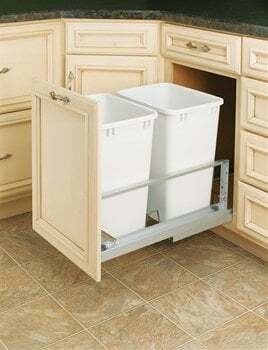 Top mount and bottom mount the common mounting styles for these trash cans. Soft Close is available on some models. 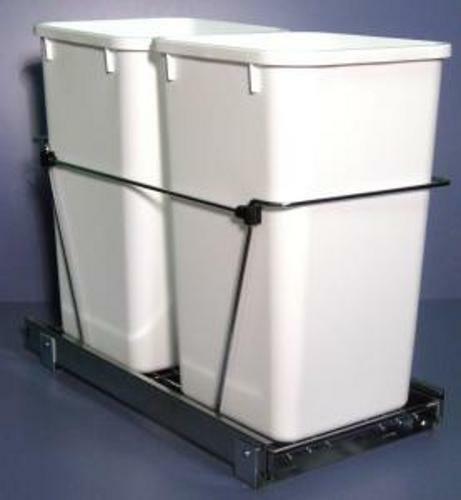 This item is a very cost effective 35 quart container, manufactured with sturdy wire support structure and high quality vinyl coating. NEW FEATURE, FULL EXTENSION SLIDES. This item is a very cost effective double 35 quart container, manufactured with sturdy chrome wire support structure and White container. Dimensions: 14-3/8" Wide x 22" Depth x 19-1/4" Height. 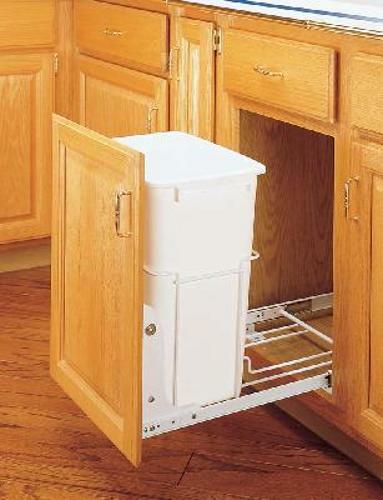 Our double 27 quart pull-out provides a full 54 quarts of storage capacity while requiring only 11-5/8" base cabinet opening. With Full Extension Slides. This item is a very cost effective double 27 quart container, manufactured with sturdy chrome wire support structure and White container. Dimensions: 11-5/8" Wide x 22" Depth x 19-1/4" Height. This item is a very cost effective 35 quart container, manufactured with sturdy chrome wire support structure and White container. Dimensions: 10-3/4" Wide x 22" Depth x 19-1/4" Height. 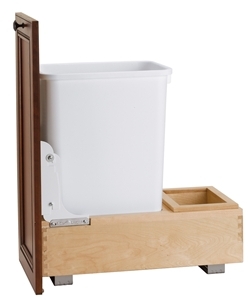 Wood Classics Trash Can, Door Mount, 35 Quart Beautiful solid wood construction, finished with a clear coating to preserve the character of the wood unit and allow an acceptable match to nearly any cabinet. Includes: Two - 35 Qt. 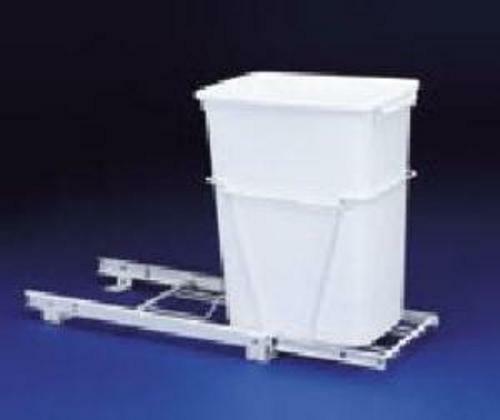 Polymer Containers, Full-Extension Slides, Pre-Assembled Door Mount Brackets. Dimensions: 14 7/8" width x 19 1/4" height x 22" depth. 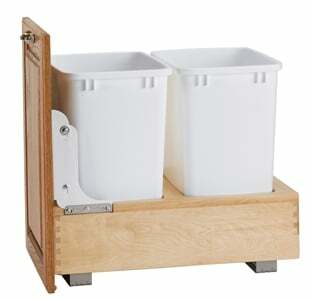 These containers are great for the bathroom vanity/dressing room. Large enough to be efficient but small enough to be out of the way. 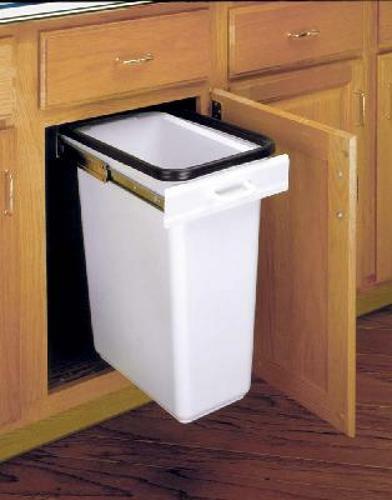 When the door is open, the lid opens & the Trash Can swings out for total accessibility. Large enough to be efficient but small enough to be out of the way. 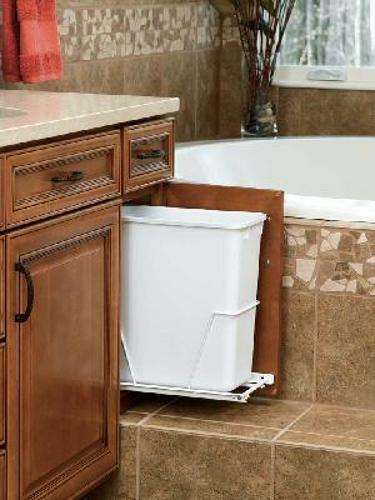 When the door is open, the lid opens & the Trash Can swings out for total accessibility. 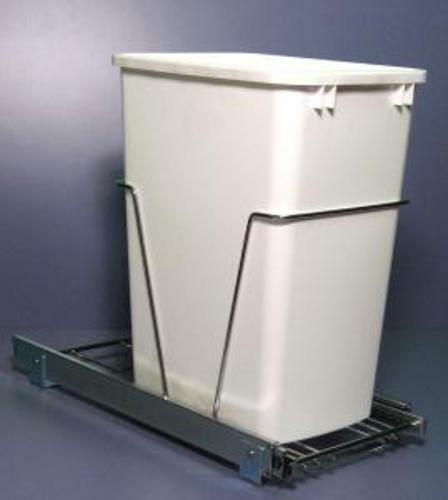 This item is a very cost effective 50 quart container, manufactured with sturdy wire support structure and hight quality vinyl coating. This item requires full height door cabinets. 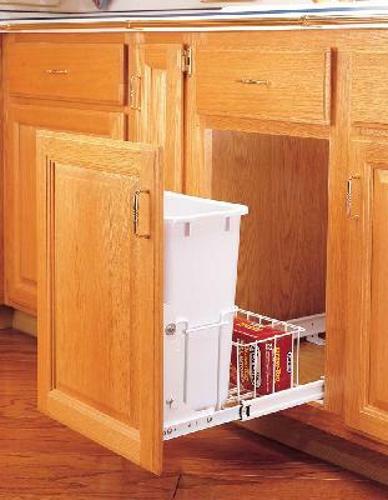 Engineered for easy accessibility & flexibility, our 50 quart pull-out provides a full storage capacity while requiring only 11-5/8" base cabinet opening. It fits a 15" frameless cabinet & 18" framed cabinet. This item requires full height door cabinets. 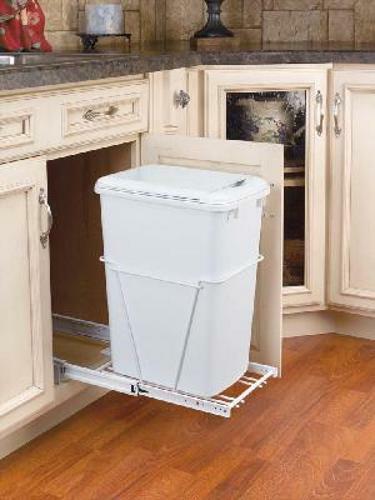 The unique design of this item makes it the perfect addition when clearance is an issue. 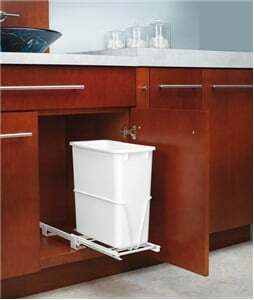 Its 16" depth allows it to fit around most plumbing situations. 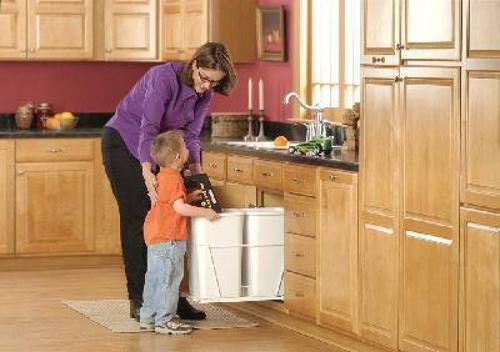 Engineered for easy accessibility & flexibility, our double 35 quart pull-out provides 35 quarts of storage capacity while requiring only 14-7/8" base cabinet opening. It fits a 15" frameless cabinet & 18" framed cabinet. 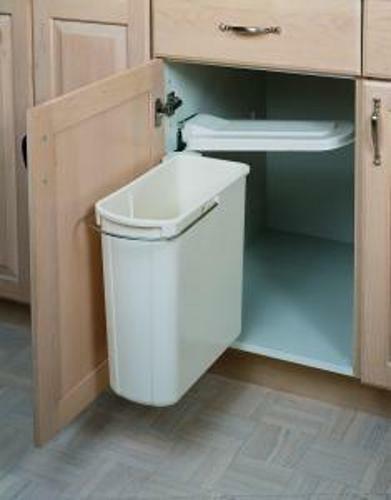 E-Z Hider is the only Rev-A-Shelf Trash Can to feature a vinyl gasket & replaceable deodorizer bar to seal odors on the inside. The 100# full extension ball bearing slides are built to handle heavy loads & ensure smooth operation. 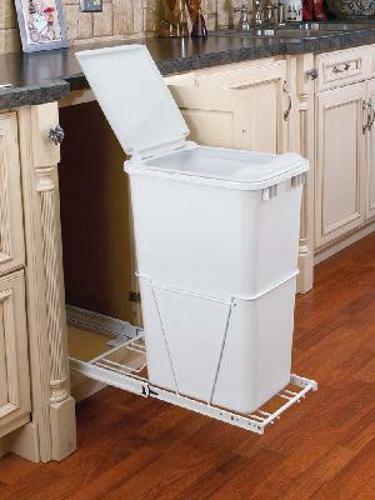 This is the Ultimate in Pull-Out Trash Cans, featuring two White 35-quart molded polymer containers with full-extension, heavy-duty aluminum slides. Door mounting system with ramp-in self-closing. This item is a very cost effective 50 quart container, manufactured with sturdy chrome wire support structure and White container. Detachable wire handle. Dimensions: 10-3/4" Wide x 22" Depth x 23-1/4" Height.